Hey David Judge here and today we’re going to talk about how and when you should upskill a VA in your business. 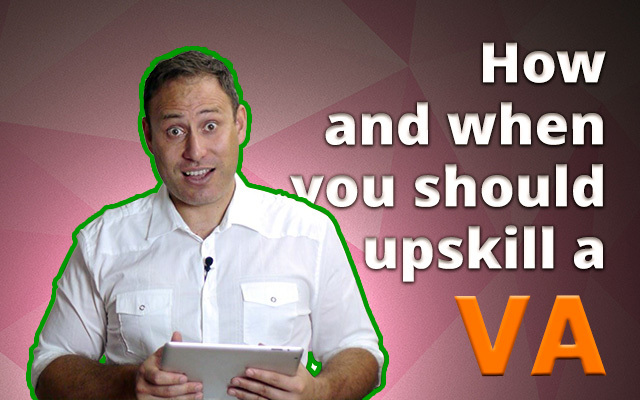 This is a really good question as there are actually a few instances that come to mind when I think of when I should be upskilling a VA. So, lets cover that off first then look at how you can effectively train a VA and finish off with how your VA can train addition people and / or VA’s in your business. Ok, this sort of goes without saying but the first instance you’ll need to upskill a VA in your business is when you employ them. Like with any new team member you will need to complete a form of ‘Onboarding’ which is the term used where you upskill your team member into their role including the sharing of the effective methods and behaviours they will need to adopt in order to be a great fit for your business. During the onboarding you would outline the tasks and start breaking them down into Monthly buckets and then the repetitive tasks into weekly buckets. If there are any existing procedures you have at this time then you would share this with the VA and get them to go through and absorb the methods. If not that’s ok, but it may take an additional investment of your time to get them up to speed. As a reference when we arrange VA’s we would understand the overall tasks we need to complete (like I mentioned earlier) and follow the same monthly and weekly exercise to drill down how the VA will work in the business. We would then flag the tasks we can upskill the VA in (using our own onboarding process) and flag the tasks the client will need to upskill the VA in. We find this works very well to get a person to perform FAST. From start to finish this should take about 4 weeks (which is around the same amount of time it would take a person locally to integrate into your business). So this would be the main time for you to upskill your VA.
Now, dependant on how you have employed a VA will be dependant on if and when you will need to upskill that team member. If you have employed a team of VA’s to act as a support for admin tasks you may want to branch one of the team members into a higher role of responsibility or if you have a single VA it could be additional tasks to free up your workload. Most recently we had a VA that was working for a client in a support ticket role and their employer is now upskilling them in web architecture as they showed a solid level of knowledge during their time working together. The point here is as your VA becomes more competent and confident within your business you will naturally delegate more for them to do. This is pretty simple and we’ve found one on one time is the best, where you can openly communicate ideas and tasks and offer / receive active feedback. You can do this via Skype (which allows voice and type communication) or several other programs like Google hangouts or facebook messenger. When it comes to demonstrating tasks I usually like to screen share and this is where I use teamviewer as it allows me to share my screen with others and I can allow others to control my computer, etc. This allows maximum interactivity and if you are getting a person to perform a task you can get them to complete that task as you watch, correcting any issues that may arise along the way. This is the same way we work with our own VA’s if we’re looking at on-boarding or upskilling them into our business or for our clients. One area where we do have the additional benefit is our physical offices where we can arrange our team to meet in the training room. This would be for a client that would employ 5 VA’s for an example and we would need to hold training with the client on a series of tasks. Ok, last point and then we’ll wrap up. Every team member we bring on board records and creates their own training manual. This is a record of how they complete each task and the elements of those tasks. They normally include Video, images and text that can be used to up-skill if you were to lose a team member or for your VA to on-train another in one or a number of roles in the business. We find this works well to have your VA create the procedures for your business, still allowing full access of this training for you to access at any time. I prefer Google Drive if you don’t have an existing system that can manage it for you as this allows you to store this information and control who and when a person can have access. Last point, if you are getting your VA to set this up for you (and as you should with any VA) ensure you get them to sign a legally binding NDA. In the next session we’re going to answer what are the exact costs of a VA. We’re talking outside of their hourly rate, what else should I have to pay for. We’ve had a massive amount of experience in this area, so it will be great to share.